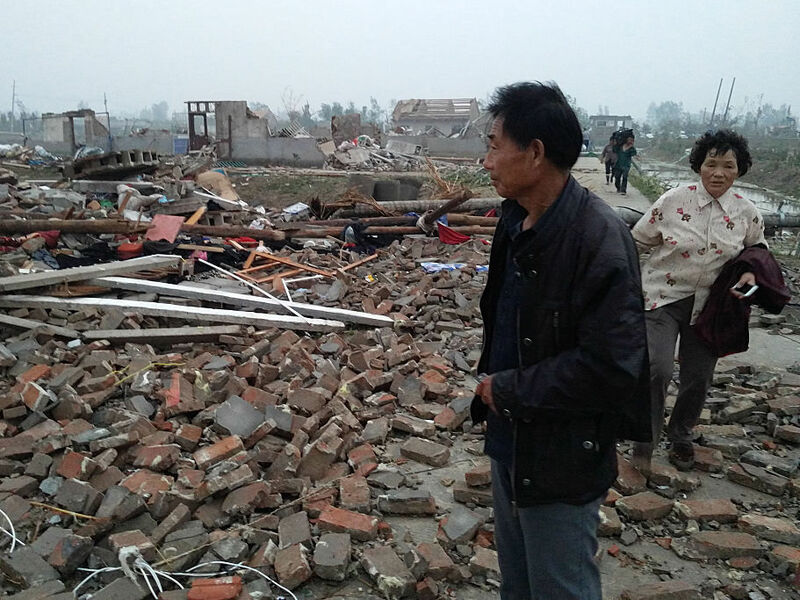 Scores Of People Killed After Powerful Tornado Slams Into Eastern China : The Two-Way A tornado and hailstorms hit east China's Jiangsu Province, killing at least 78 people. At least 500 people were injured — 200 critically — and search and rescue efforts are ongoing. Residents look through the rubble of destroyed houses after a tornado in Yancheng, in China's Jiangsu province on Thursday. A powerful tornado, hailstorms and heavy rain hit eastern China's Jiangsu province Thursday, killing at least 78 people, the official Xinhua news agency reported. The news service adds that "nearly 500 people were injured, 200 critically." The severe weather slammed Yancheng City starting at about 2:30 p.m., "destroying homes and trapping hundreds of villagers in the rubble," Xinhua says. It adds that the death toll is likely to rise as search and rescue operations continue. China's president Xi Jinping ordered "all-out rescue efforts and the prioritization of life-saving measures" while in Uzbekistan on a state visit, according to the news service. The civil affairs ministry says that "emergency supplies, including 1,000 tents, have been rushed to the scene," Reuters reported. Photos released by Getty Images show homes completely smashed into rubble and trees uprooted, as residents pick through the scene of devastation for their belongings. "I heard the gales and ran upstairs to shut the windows," Xie Litian, 62, told Xinhua, according to the Associated Press. "I had hardly reached the top of the stairs when I heard a boom and saw the entire wall with the windows on it torn away." 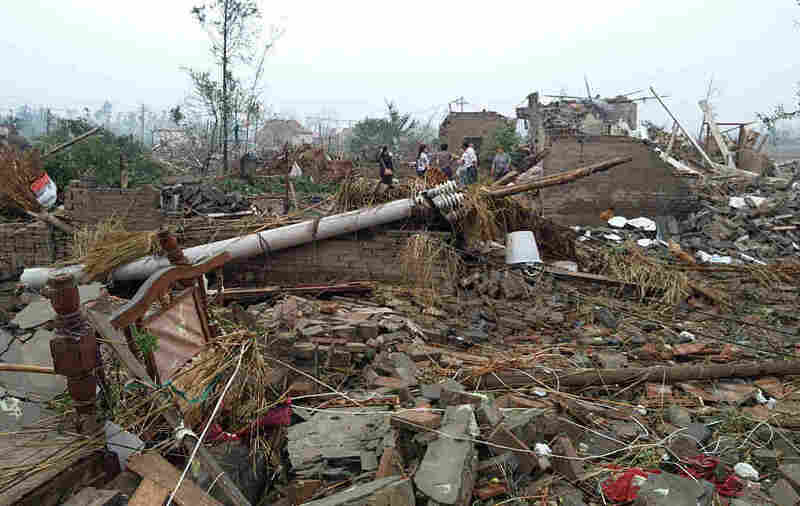 The New York Times explains that "tornadoes are relatively common in Jiangsu Province, in China's southeast, with more than 1,000 recorded over the past six decades, according to Chinese news reports. Southern China has faced several bouts of extreme weather recently, with floods killing more than 20 people this week." Still, Xinhua says that Thursday's severe weather is "one of the deadliest natural disasters to hit east China's Jiangsu Province in decades."